Most people have heads. So when you see someone without a head, it's a bit of a novelty. 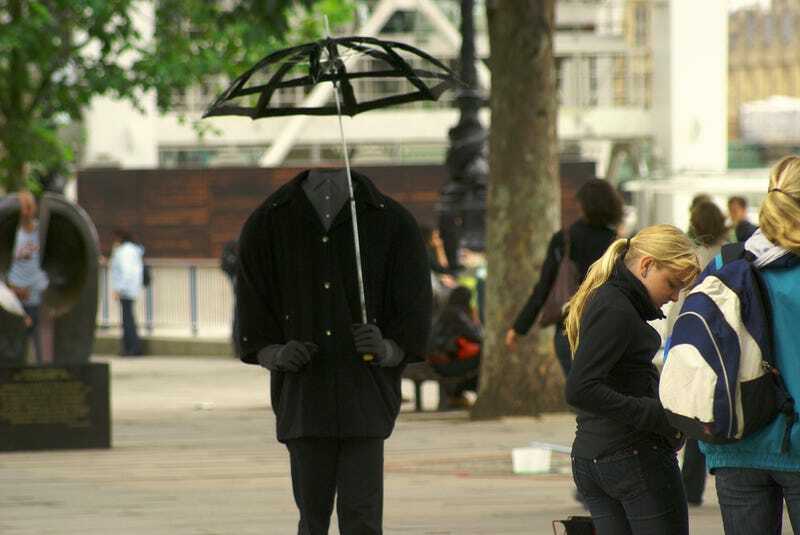 So for this week's Shooting Challenge, we want you to photography headless people doing everyday things. But how? Now while you're free to build a complicated suit that creates the illusion of headlessness, we have a better plan: Set your camera on a tripod or a table (anywhere it can't move). Take a picture of your subject (head attached). Then have them leave the scene and take another picture. In post production, stack the two images so your human is on top. Erase the head, and the background will be there (like magic!). Now, the collar may need some clone stamp finessing, depending on your angle. It's something to keep in mind. Our lead image is by flickr's Le Turc. It's a photo of a street performer in Paris. Given that most of you will be using Photoshop to cheat, it's likely your work will look even better. Send your best photo by Monday, December 16th at 9AM Eastern to contests@gizmodo.com with "Headless" in the subject line. Save your files as JPGs, and use a FirstnameLastnameHeadless.jpg (970px wide) and FirstnameLastnameHeadlessWallpaper.jpg (2560px wide) naming conventions. Include a recipe along with a story of your tradition in a few sentences.